QUESTION: There are many people who are now saying we are headed into a recession. Your model shows we are coming to the end. Yet you have been the only analyst who has been correct. There are bankers warning the stock market will collapse by 50% because it always goes down in a recession. I watched the market rally to new high as you forecast back in 2010 going into 2015. Then you warned the market would invert and continue the rally after 2015. The market rallied into nearly your Pi Target in 2018. You said at the last WEC there would be a correction back to retest the monthly bearish reversal. You have been correct at every turn. 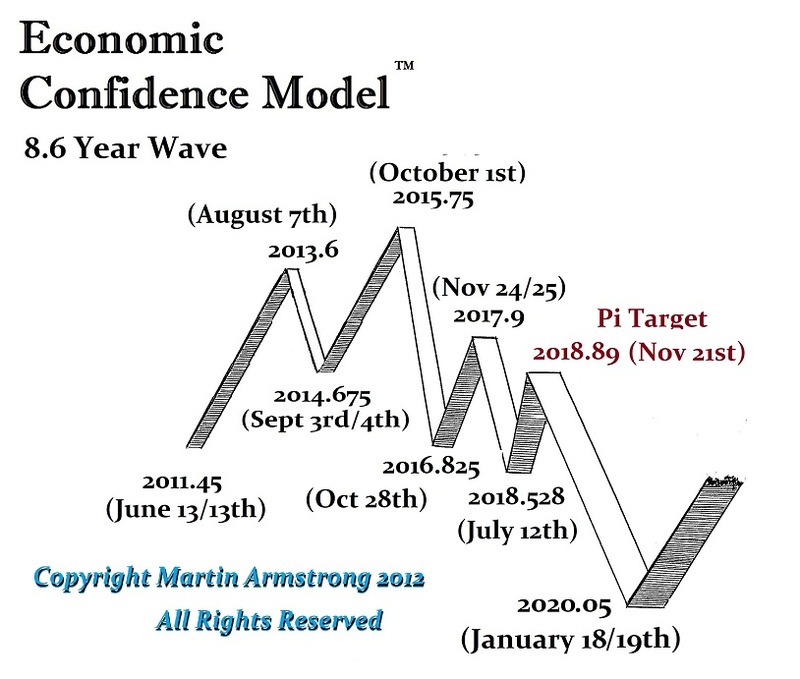 Back in 2014, you posted: “What will not go down when the cycles shift, inverts and rises even further.” It seems that this has been a cycle inversion where the market has just been rising through the upside and downside of your model. My question is this. You still forecast that this is just the staging ground and we are about to see a different pattern altogether. Is this all part of the cycle inversion you have been stating is underway? ANSWER: Yes. I also wrote in that post: “This is why I have been warning a cycle inversion is coming. We may be in that process now starting from November 19th/20th.” With all the craziness on the horizon economically, the government was the one in trouble, not the private sector. That meant we had to undergo a cycle inversion. That is what is underway. A normal cycle would have seen the market peak in October 2015 and then decline. The fact that the market has continued to rally past 2015 proves this is a cycle inversion. We will be addressing this at the Rome WEC. We are about to make a major play that will be critical to understanding for the future.